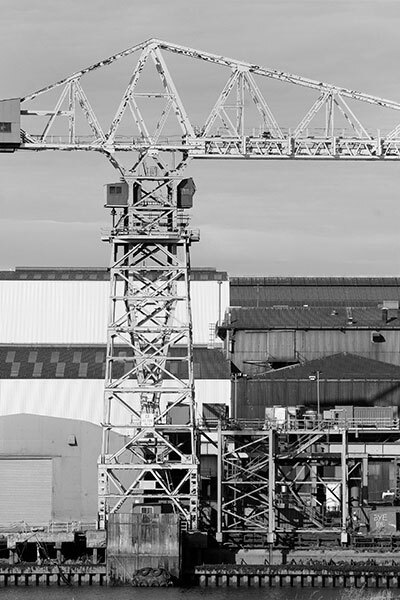 Early in 2007 an agreement was reached for the sale of much of the equipment, machinery and cranes from the Wallsend-on-Tyne yard of Swan Hunter, to Bharati Shipyards of India. This and the following Gallery shows a selection from photographs made between June 2007 and April 2009. 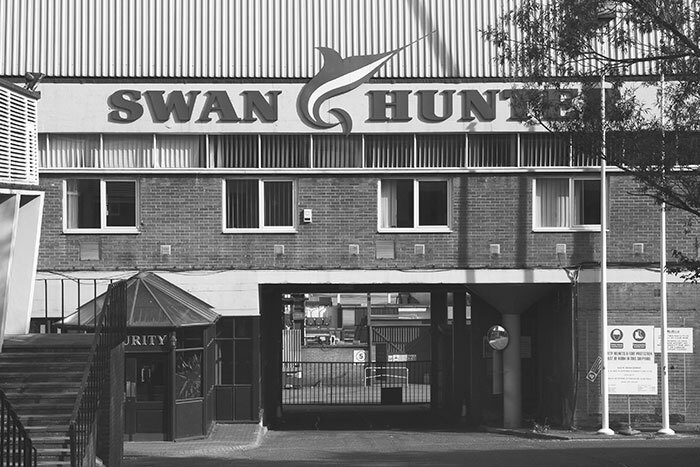 A website, swanhunter.com, presents a detailed but concise account of the intricate development of the Company's constituent parts from 1852 until final closure in 2006. Evolving individually since the 1850s and operating adjacent yards Wigham Richardson & Co. Ltd and C.S. 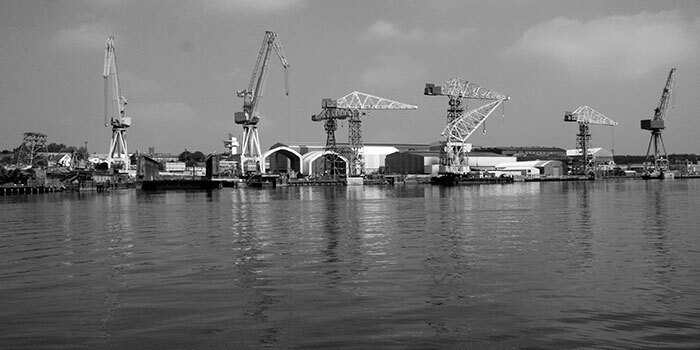 Swan Hunter Ltd amalgamated in 1903 to create Swan Hunter & Wigham Richardson Ltd. 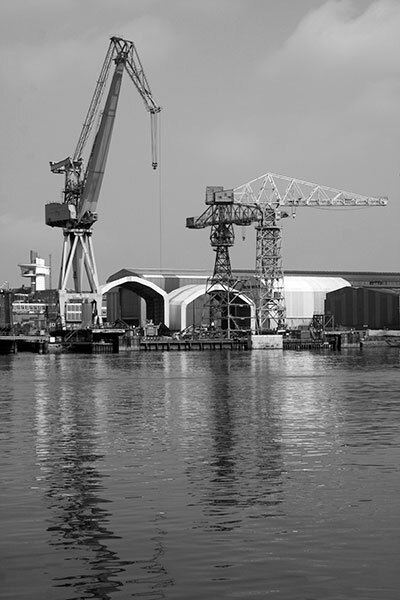 Rapid acquisitions of other yards and engineering works established a powerful shipbuilding consortium on the River Tyne. Credited with building some1,600 naval, cargo and passenger ships the Company encountered increasing financial difficulties at the end of the twentieth century. Backed by the capacity and technical range created in the merger the new Company gained the Cunard Steamship contract to build the RMS Mauretania for their Atlantic service. She and her sister ship Lusitania were then the largest of their kind. The Mauretania was 790 feet in long, weighed almost 32,000 tons and was fitted with Charles Parsons' then revolutionary steam turbines engines. Her elegantly proportioned hull with its straight stem, clipper stern and four tall funnels painted Cunard red and black must have been a fine sight. Anglo-German rivalry at the time spurred builder and operator to create the fastest liners afloat. Government financial assistance included a design requirement for operation as an armed merchant cruiser and a guaranteed 24 knot cruising speed. Launched in 2006 and averaging 23.69 knots she soon took the east-bound Blue Riband record from North German Lloyd. The westbound Riband was won in 1909 and held until 1929 when it was taken by the Bremen, a new German liner. In 1935 the Mauretania was scrapped in Rosyth. 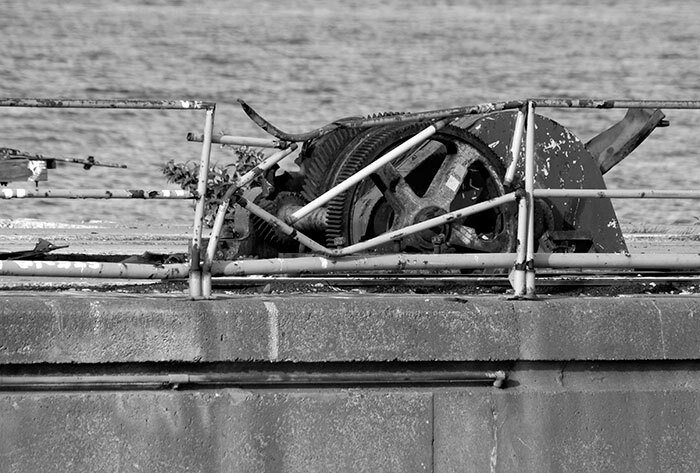 When I began to photograph the dismantling I was restricted to available viewpoints from outside the yard. Long lenses were invaluable but it would have been both challenging and rewarding to work within the yard itself. With the wisdom of hindsight I would have visited more often and made more images but it was not to be. 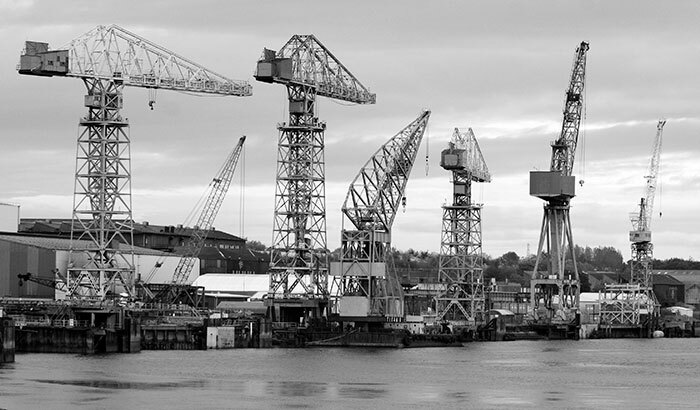 It was dispiriting to record the demise of such a major yard in what was once the shipbuilding country to the world. It echoed what had been underway in British manufacturing generally after the 1970s. I had no thoughts of a systematic study with a history in mind. I worked around the yard from vantage points on both riverbanks framing images that appealed. A long interest and working involvement in art and design, including both figurative and abstract painting, influenced my approach. Although working in colour I had intended to present the final images in black and white, with colour in those where it was most appropriate. I worked in portrait and landscape formats with the intention of cropping where necessary to achieve the composition I sought. 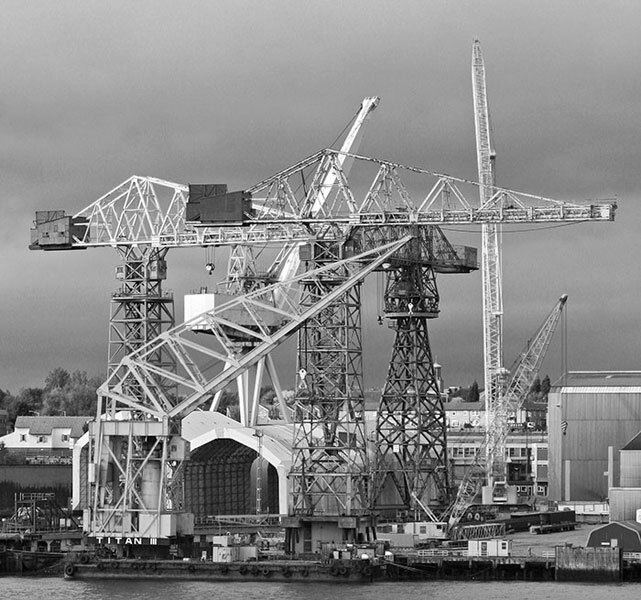 Looking downriver on the waterfront placed three cranes in line astern on the dockside where Titan III, the yard's floating crane was moored. I liked the structural contrasts of the twins to the left, their taller modern companion and the broad shoulders of the fourth. I also liked the colour contrasts which I have, of course, since removed. The twins had somewhat faded and rust spotted blue towers and yellow jibs, number three sported dark blue and the floater's once powerful red had faded towards pink. 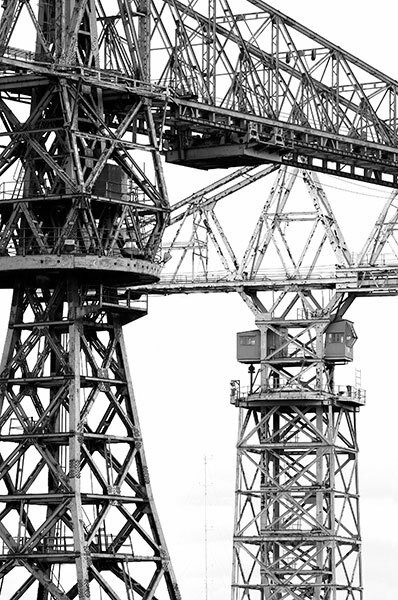 At ninety degrees to the previous image the twins' intricate tower steelwork and the cabin level linking to the more open jib trusses attracted. The floating crane stands behind. The geometry of the structural steelwork directed this composition. 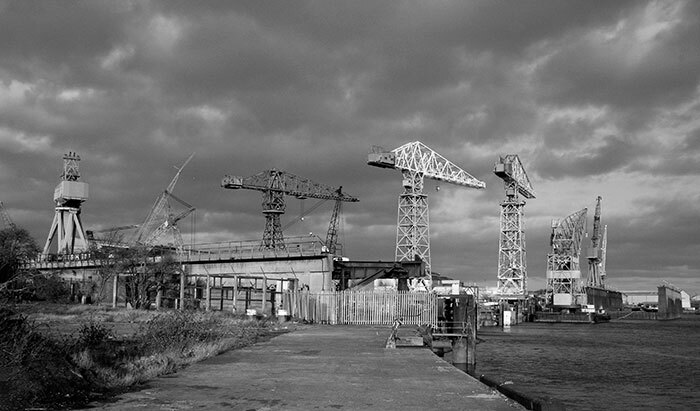 The towers of this pair of cranes and the similar third one in Image 06 were fixed to the shipyard floor. As far as I could see, only mobile cranes were dismantled for shipment to India. I was away from home when the twins were brought down explosively in June 1910 when demolition and removal of everything in the yard was approaching completion. 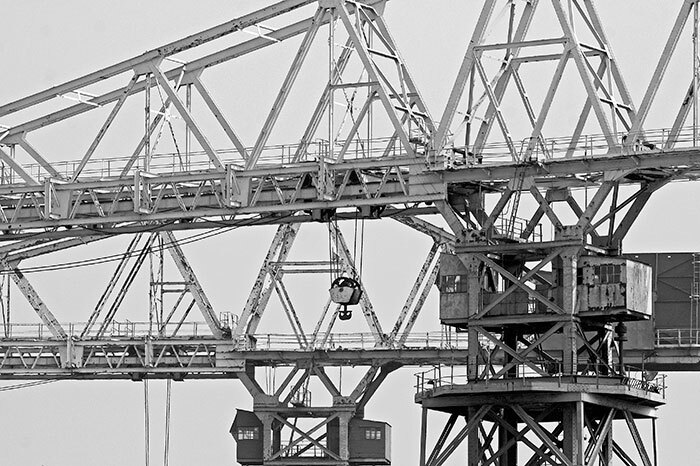 Two jib arms of one of the demolition cranes frame the enormous sheet steel legs of a rail borne crane framing a fixed truss girder specimen beyond. The cab of the first was low to the ground and moved around the yard on broad caterpillar tracks. Its exceptionally high articulated jib had sufficient reach and lifting capacity to move parts from those being dismembered for removal. The second appears in Images 12-16 and the third in Images 08 and 09. The foreground wheel and rail moving crane finished in a rather shabby camouflage green paint was India bound. It and the others were all involved in dismantling machinery and buildings and sometimes one another. 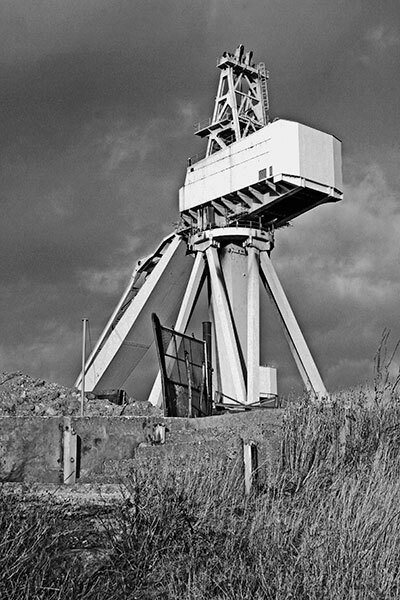 One of the crane twins from the Images 08 and 09 stands beyond. Like long-legged flamingos or praying mantis this and its twin dominated the yard. Faded to a colour nearer pink than red they must have been a dramatic sight in coats of pristine paint. 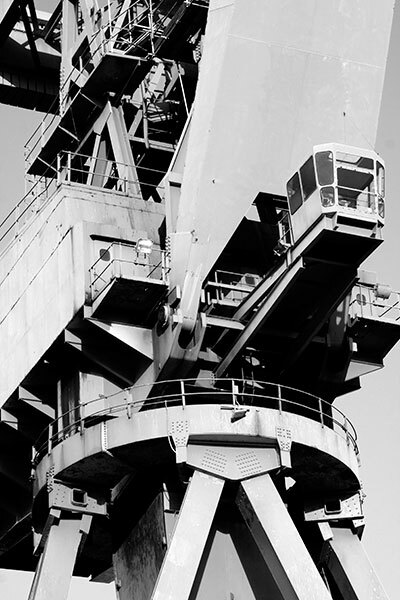 Heavy rail lines carried these behemoths alongside the shipbuilding ways. 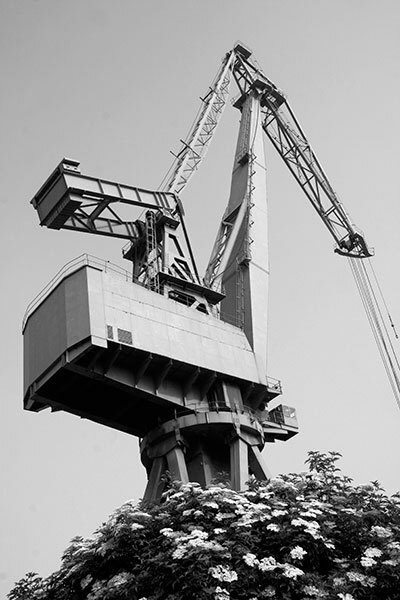 The operator's cabin seems insignificant when set against the complexity and scale of the crane's operating head and the top of its undercarriage. Its jib lowered, the crane has reached the end of the long first part of its working life. 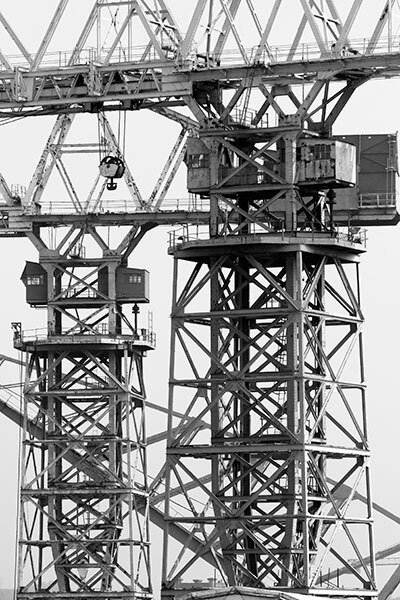 This panorama shows structural details of the two cranes. 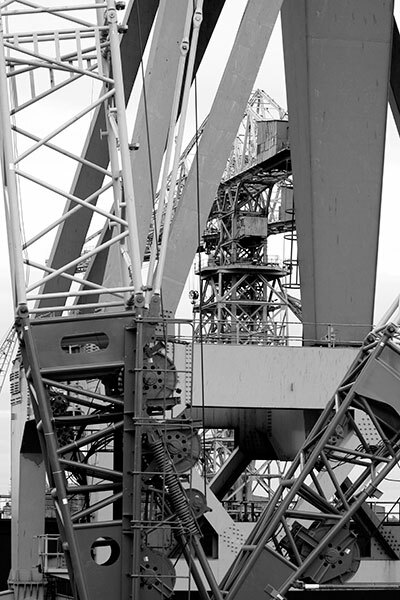 Many of the buildings at the east end of the yard seem intact but inside much of the heavy engineering equipment had been taken apart and the overhead gantry cranes removed. Bharati had acquired everything required to establish anew a fully operational shipbuilding yard. 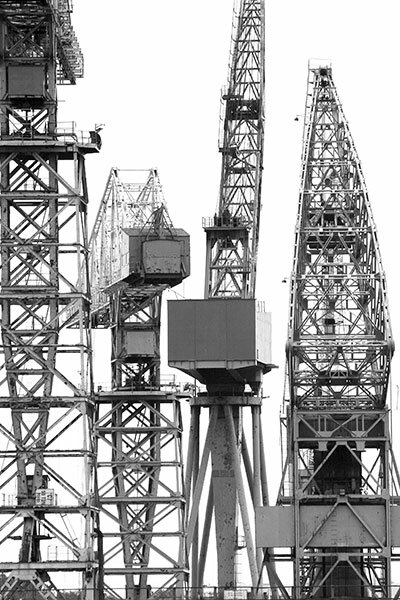 Low afternoon sunshine cutting under darkening cloud highlights cranes and structures on the waterfront. This set of gears, function unknown, was inserted into the top edge of a dry dock wall. Several dry docks and building ways were angled into the river west of the main yard. 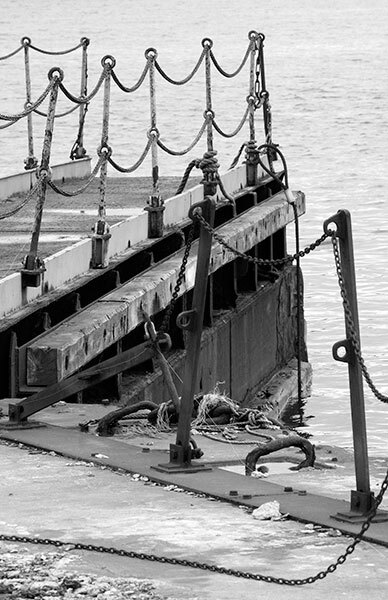 On this dock the gates stood open at random, neglected and corroded. Most of the associated workshop buildings backing them and all of the machineryt they contained had gone. On some of them the dilapidation and dereliction seemed longer standing. 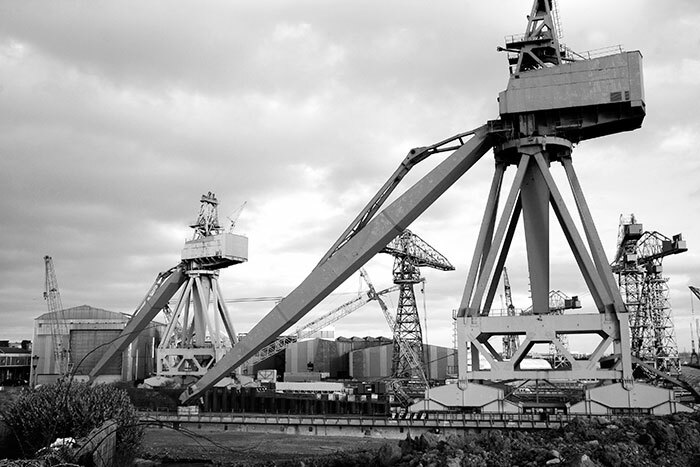 More images are contained in the A WAKE FOR SWAN HUNTER 2 Gallery.